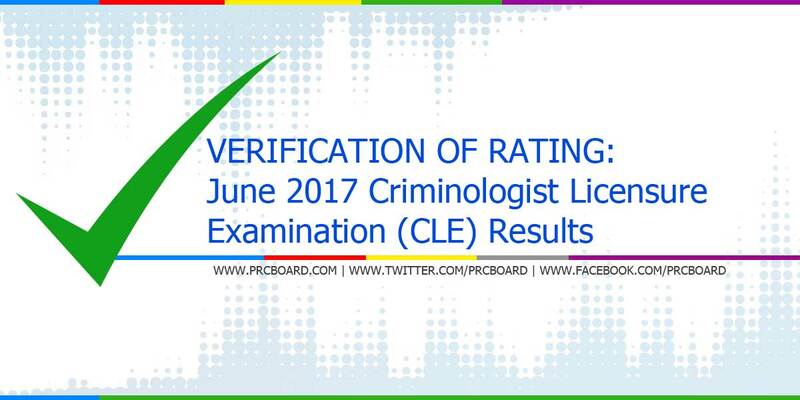 MANILA, Philippines - The verification of ratings and test results for the June 2017 Criminologist Licensure Examination (CLE) given by PRC Board of Criminology will be available online few working days after the posting of results. Passers of June 2017 CLE are advised that the Professional Regulation Commission has fully utilized the online registration for issuance of Professional Identification Card and Certificate of Registration in Manila. The date of registration are provided in the main page together with official results. As announced by PRC, the oath taking ceremony of the successful examinees will be held on August 12, 2017 (Saturday), 1:00 P.M. at the Plenary Hall, PICC, CCP Complex, Pasay City. The dress code for the occasion is formal attire. To keep updated on related news and announcements about CLE/Criminology board exam, we advise our readers to visit PRC official website or follow us at our social media accounts via Facebook and Twitter. Kailan niyu po ba ilalabas an verification of rating. Para makita napo namin. Pakilabas na po yung rating bakit ang tagal! An demanding mo naman, hintayin mo matapos! Tama lang yang comment para bilisan nila. Alam mo naman na lahat ng systema sa pinas matagal! wala parin po ba rating? possible po ba mailabas this week ang rating po ? Kay lang po lalabas ang rating?? Dapat Hindi niya inilabas ang result ng exam.kung walapang rating dapat kc magkasabay ang rating at result.para walang comments. my rating na po guys check niyo!!! Wala pa ba ang rating? yung mga pumasa lng po ba ang may ratings bakit wala pa sa mga di pumasa paano din namin malaman kung saan kami sumablay po ,sana ma release nyo na rin para maka umpisa na rin kame sa pag review ,salamat PRC....!!!!! !